“I don’t believe I can really do without teaching. The reason is, I have to have something so that when I don’t have any ideas and I’m not getting anywhere I can say to myself, “At least I’m living; at least I’m doing something; I am making somecontribution” — it’s just psychological. The questions of the students are often the source of new research. They often ask profound questions that I’ve thought about at times and then given up on, so to speak, for a while. It wouldn’t do me any harm to think about them again and see if I can go any further now. The students may not be able to see the thing I want to answer, or the subtleties I want to think about, but they remind me of a problem by asking questions in the neighborhood of that problem. It’s not so easy to remindyourself of these things. I just filled out the CHI reviewer pre-review questionnaire. The final question asks about general thoughts on the CHI review process. I have documented my answer below. None of the potential improvements I mention are really novel – they have been implemented at other conferences or journals before. Edit (01.10.2015, 09:15 UTC+2): I would not expect such changes to be made for CHI 2016 or 2017. Instead, some of these changes could be tried out at smaller conferences first in order to work out a usable implementation. I find the currently practiced pre-publication peer review quite problematic. I have reviewed or otherwise seen plenty of papers that contained interesting findings but were rejected (sometimes rightfully) due to some flaw or another. A huge share of these rejected papers was never published in another venue, the insight contained in them (and errors from which others could learn) lost to the community. Many other papers were only published one or more years later – thereby delaying all research that could build on it or try to replicate its findings. I would very much like CHI to adopt a post-publication peer review or a similar approach that improves speed and visibility. For example, a process similar to alt.chi (in some ways) would be great, where all submitted papers are made public or semi-public and peer review then selects those that are to be presented at the conference. Ideally, reviews would also be published for all papers. This would also make it harder for authors to re-submit their paper unaltered to another conference without addressing the issues mentioned by the reviewers. I hate when I give extensive feedback to a paper and the authors do not even bother to fix the spelling errors that I pointed out when they submit it to another conference. Quite often I read a paper which incorrectly quotes a paper of mine or which omits important related work. With the current review process, the quality of the reviews depends on the ACs ability and desire to find the right reviewers. Allowing any researcher to provide a review for a submitted paper would make sure that domain experts can chime in and point out flaws or interesting use cases that the other reviewers missed. This has already been tried at alt.chi, too. The standard PCS review form asks the reviewer how they would rate their expertise on a four-point Likert scale. This is a rather simplistic measure. While I feel very competent to judge novelty or validity of a sensing technique, I can not honestly tell whether the correct statistical tests were used in the evaluation of this technique. Similarly, I won’t be able to tell whether all relevant related work has been cited in a paper on design techniques but can certainly offer my opinion on further applications or spelling errors. I would prefer to describe my expertise more accurately and also focus only on certain aspects of a paper as a reviewer. By telling the AC that I do not know enough about statistics, I give them the opportunity to find another reviewer who does. Furthermore, the AC could also assign a subset of reviewers to individual aspects of a paper (e.g., related work, writing style, experimental setup, statistical tests, technical correctness, replicability). This could avoid duplicated work and simultaneously increase the quality of the reviews. Given that the program chairs of recent CHI conferences have put much effort into evolving the conference series, I am optimistic that some of these proposed changes will be implemented in the near future. And frankly, it would be very fitting for the CHI community to be at the forefront of academic collaboration and publishing. I just found time to import my old blog formerly hosted on my.opera.com/raphman . Posts and comments have been imported flawlessly.However, all images are currently broken until I fix the links. Am 3. Juli 2013 hat die Mitgliederversammlung der Deutschen Forschungsgemeinschaft (DFG) mehrere Ergänzungen zu ihren Empfehlungen zur Sicherung guter wissenschaftlicher Praxis beschlossen. Diese wurden am 4. Juli veröffentlicht. Im Vorfeld hatten ich und andere Befürchtungen geäußert, dass insbesondere eine neue Empfehlung – Nr. 17 – den offenen wissenschaftlichen Diskurs einschränken könnte. Stefan Heßbrüggen hat am 2. Juli 2013 auch eine Petition gegen diese neue Empfehlung und die ihr zugrundeliegende Empfehlung der Hochschulrektorenkonferenz (HRK) gestartet. Haben sich nun unsere Befürchtungen bewahrheitet? Darauf hat noch niemand eine Antwort. Die DFG-Empfehlung ist weit weniger drastisch formuliert als es noch die HRK-Empfehlung war. Zumindest der zweite Teil der Empfehlung ist aber trotzdem unnötig, stiftet Unsicherheit, und beschädigt Vertrauen. Im Folgenden versuche ich, zu klären, was Empfehlung Nr. 17 für den allgemeinen wissenschaftlichen Diskurs, für die Aufklärung von Fehlverhalten und für das Vertrauen in das Wissenschaftssystem bedeutet. 14.07.2013: Stefan Heßbrüggen diskutiert auf Carta intensiv den Konflikt zwischen DFG und HRK bezüglich Whistleblowern. 12.07.2013: Nachtrag: wie schon am 10.7. korrigiert (siehe unten), entspricht die verabschiedete DFG-Empfehlung der Beschlussvorlage des DFG-Senats. 12.07.2013: In einem merkwürdigen Editorial vom 10.07.2013, das mehrere faktische Fehler enthält, hat die Fachzeitschrift Nature die DFG-Empfehlungen kritisiert. 10.07.2013: Die DFG hat in einer Pressemitteilung noch einmal explizit erklärt, dass sich die Vertraulichkeit rein auf das Ombudsverfahren bezieht, nicht auf sonstigen wissenschaftlichen Diskurs. Wissenschaft basiert nicht auf blindem Vertrauen, sondern auf immanentem Zweifel. Wissenschaft braucht aber auch Vertrauen, intern und extern. Intern erleichtert es uns Wissenschaftlern die Arbeit, wenn wir unseren Fachkollegen ein Grundvertrauen entgegenbringen können, und nicht dauernd nagende Zweifel an ihrer Redlichkeit hegen. Extern braucht Wissenschaft das Vertrauen der Gesellschaft, die sich ja auf unsere Erkenntnisse verlassen und unsere Forschung finanzieren soll. Dieses Vertrauen untereinander und der Öffentlichkeit in uns ist immens viel wichtiger als mögliche Reputationsverluste eines Einzelnen. Transparenz schafft Vertrauen – und nicht Kommissionen, die im Geheimen entscheiden, wer weiterhin vertrauenswürdig ist, und wer nicht. Alleine die Tatsache, dass HRK und DFG geschlossen der Heimlichkeit den Vorzug geben, nimmt mir wieder ein Stück Vertrauen in unser Wissenschaftssystem. In Ihrer Mitgliederversammlung vom 1.-3. Juli 2013 will die Deutsche Forschungsgemeinschaft (DFG) ihre “Vorschläge zur Sicherung guter wissenschaftlicher Praxis” um einen weitere “Empfehlung” (Nr. 17) ergänzen: Vorwürfe wissenschaftlichen Fehlverhaltens dürfen nur noch den Ombudspersonen mitgeteilt werden und nicht mehr öffentlich diskutiert werden. Dies wird anonyme Beschuldigungen nicht stoppen. Wer aber unter seinem bürgerlichen Namen öffentlich wissenschaftliches Fehlverhalten anprangert, verstößt in Zukunft – nach Meinung der DFG – selbst gegen die Regeln der guten wissenschaftlichen Praxis. Whistleblower können dadurch von der DFG-Förderung ausgeschlossen werden – mit dramatischen Folgen gerade für junge Wissenschaftler. Die neue Empfehlung Nr. 17 ist ein Gummiparagraph, der den wissenschaftlichen Diskurs in Deutschland lähmt und die Aufklärung von wissenschaftlichem Fehlverhalten verhindert. 10.07.2013: Die DFG hat in einer Pressemitteilung explizit erklärt, dass sich die Vertraulichkeit rein auf das Ombudsverfahren bezieht, nicht auf sonstigen wissenschaftlichen Diskurs. 08.07.2013: Ich habe meine Meinung zur Empfehlung 17 noch einmal als Blog-Eintrag dokumentiert. 04.07.2013: Die DFG hat die neue – gegenüber der HRK-Formulierung weniger scharfen – Empfehlung 17 heute veröffentlicht (PDF). 02.07.2013: Es gibt jetzt eine Petition an die DFG auf change.org. Ich warte noch ab, was morgen auf der DFG-Mitgliederversammlung überhaupt beschlossen wird. 01.07.2013: Erbloggtes erklärt eloquent, weshalb Ombudssystem und öffentlicher Diskurs zusammengehören. 01.07.2013: English blog post “Whistle blowing in the German University: A Regulatory Scandal in the Making” by Stefan Heßbrüggen-Walter. 29.06.2013: Link zu Blogeintrag von Benjamin Lahusen eingefügt. 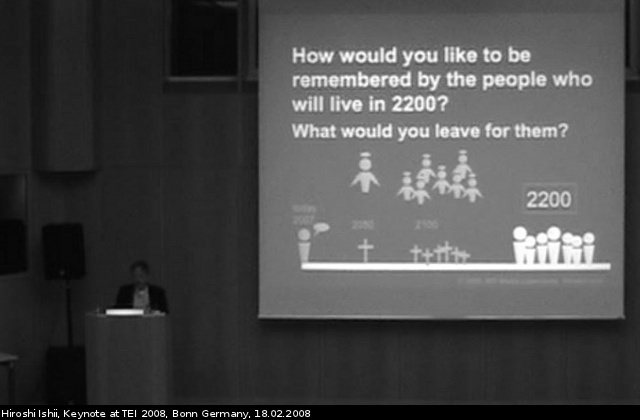 How would you like to be remembered by the people who will live in 2200? At TEI 2008, Hiroshi Ishii gave a very interesting keynote, presenting highlights of the incredible amount of research he had been involved over the last decades. Update (08. March 2012): Wiley has informed me that they just fixed the issue. 70 GB of digital content from Wiley’s Major Reference Works can be downloaded for free from Wiley’s web server. This is probably not intended, as Wiley still charges hundreds or even thousand of Euros for each one. I notified them of this fact several times during the last two months. They do not seem to mind. In this post I explain how I found out about this, how one can download the content, and why this is probably legal (at least in some jurisdictions).